Adding additional shelving space to your grid panels or gridwall fixtures can easily be done by utilizing one of our gridwall shelf brackets. 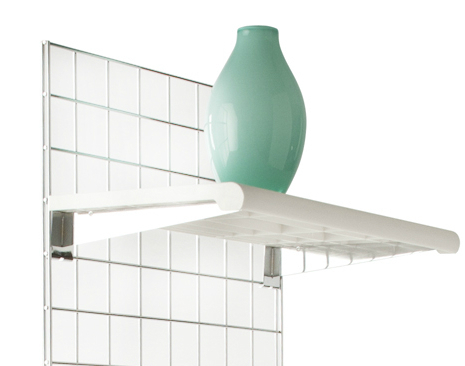 Our gridwall shelf brackets will snap-on to any grid wall panel that has 3” square grids. Simply snap on the grid brackets onto your grid panel and place the shelf on top of the brackets; The 12”grid wall shelf bracket can hold any shelf that is 12” deep, and the 14” wire grid shelf bracket will hold any shelf that is 14” deep. By attaching a shelf rest to pre-drilled holes on the gridwall shelf bracket and combining them with clear cushions for the shelf to rest on, you will be able to convert the standard grid bracket into a bracket capable of holding glass shelves.